Our story begins with Dorothea Mitchell, born in England in 1877 and raised in India, where her father was involved in railway construction. Disappointed in having no sons, Dorothea’s mother encouraged and her sister to becoming practiced in what were considered manly occupations, such as carpentry, marksmanship and military-style riding. The family returned to England in the 1890s, and when her father died Dorothea became, in her words, “the man of the family”. She emigrated to Canada in 1904, ran a boarding house in Toronto, then became the companion help to a mining engineer and his wife at Silver Mountain, Ontario. She went on to run a general store, then to manage a sawmill. Her family joined her when she succeeded, unusually, in obtaining land under the Homestead Act, such as was not generally granted to women. In 1921 she moved to Port Arthur, becoming a teacher and then a bookkeeper. Her hobby was photography, and in 1929 she met Fred Cooper, a bakery store owner, who had purchased a 16mm film camera when he and his wife went on a trip to England. Cooper and Nitchell were seized with an enthusiasm to make a fiction film. Cooper and Mitchell established the Amateur Cinema Society of Thunder Bay (aka Port Arthur Amateur Cinema Society), which became a member of the Amateur Cinema League – an American-based but worldwide federation of amateur film clubs, evidence in itself of the great enthusiasm for amateur film production (particularly dramatic films) at this time, encouraged by the introduction of 16mm film stock in 1923. Neither had any of us the foggiest notion how long the completed story would run. We just kept going. (The ultimate was 1600ft). Directly after a roll was exposed, it had to go east to be processed and on its return the cameraman, director and I would congregate in my office (evenings of course), run it through a projector and cut it up. As Secretary Treasurer (and a few other odd jobs for good measure). I kept a record of every clipping, placing each in numbered section of egg-boxes – I’d dozens of them! – until interiors were taken and could be inserted in appropriate spots. Yes, there was ample unseen work, as well as fun. It may interest modern amateur-movie makers to know that projectors at that time were treacherous creatures! If stopped while the lamp was “on,” the film scorched – naturally adding to the ticklishness of the constant reviewing necessary. The film was followed just a few months later by production, Sleep Inn Beauty (1929), a short comedy about a bathing beauty contest, directed, written and photographed by the same trio. The Society’s final production was to have been The Fatal Flower (1930), but although photography was completed, a lack of funds and apparently some waning enthusiasm from other Society members meant that the 45-minute film remained unedited and unviewed. 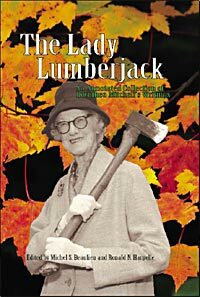 Mitchell went on to take charge of the Voluntary Registration of Canadian Women during the Second World War, took up amateur filmmaking again in her sixties with the Victoria Amateur Movie Club, then turned to writing short stories and an autobiography of her younger days, Lady Lumberjack, published in 1968. She died in 1976, aged ninety-nine. Happily, Mitchell’s films, along with her papers, have survived, and an active project exists to research and promote the work of Mitchell and the Amateur Cinema Society of Thunder Bay, centred on the website www.ladylumberjack.ca. Named after the title of the Society’s final, unfinished film, the aims of the Fatal Flower Project are to make available again the films made by the Society and now preserved by Library and Archives Canada, on DVD and online; to republished the book Lady Lumberjack; to produce educational packages; and boldest of all to finish off that unfinished film, The Fatal Flower. Using Mitchell’s original footage, the Project has edited the film and added its own titles in a style emulating that of Mitchell’s earlier films, produced a music score and even created period-style posters. And there’s more. Local filmmaker Kelly Saxberg, Fatal Flower Project member and someone greatly enthused by the story of her enterprising predecessor, has produced a documentary, Dorothea Mitchell: A Reel Pioneer, which tells the story of Mitchell, the Amateur Cinema Society of Thunder Bay and the reconstruction of The Fatal Flower. The documentary is embedded at the top of this post, and as you will have seen, A Race for Ties and The Fatal Flower have recently been made available online through Vimeo. The documentary can also be ordered on DVD. The Fatal Flower Project talks up Dorothea Mitchell a good deal. The Fatal Flower itself is now headed by the words “a film by Dorothea Mitchell”, which wouldn’t have been on the original titles had they been written. There is much about the importance of her work to Canadian film history (A Race for Ties is championed as “Canada’s First Amateur Feature-Length Film”), particularly women in early Canadian film history (the documentary compares her to the rather better-known Nell Shipman). The literature stresses the importance of the films to the history of what is now Thunder Bay, Ontario, and there is much in the films that was clearly aimed at a very specific audience, the films haing been screened locally at the time to raise funds for charity. Are the films any good? Of their kind, they are more than competent. They have all the hesitancies and gauchness of amateur dramatic films, but they were put together competently and entertainingly. Mitchell could construct an extended film story, and Harold Harcourt did rather well as a director for military adviser. There is good, varied use of locations, and the performances of the amateur cast are fine. You might need to be Canadian to see the most in the films and their story, still more someone from Thunder Bay, but there is something for anyone in the tale of Dorothea Mitchell and her film society, and the films charm and entertain. Perhaps most importantly the project serves to highlight the great enterprise, enthusiasm and cine-literacy demonstrated by the large number of amateur filmmakers at this time, whose love of the cinema could not be contained simply by going to the cinema. A very good job has been done all round. The Lady Lumberjack site is at www.ladylumberjack.ca. It has detailed background information on Mitchell’s life and her films. The films and documentary are available to view on the Lady Lumberjack Vimeo channel. SleepInn Beauty is not available online at present.